Iraq is uniquely positioned at the heart of the Middle East. It is bounded by Iran in the east, Turkey in the north, Syria in the northwest, Jordan and Saudi Arabia in the west and southwest, and Kuwait and the Gulf in the south. Iraq is traversed by two great rivers, the Tigris and the Euphrates, both of which rise in the eastern mountains of Turkey and enter Iraq along its northwestern borders. After flowing for some 1,200 km through Iraq, these two rivers converge at Karmat Al, just north of Basrah, to form the tidal Shatt Al Arab waterway, which flows some 110 km to enter the Gulf. The wetlands in the middle and lower basin of the Tigris and Euphrates Rivers in Iraq were, until recently at least, much the most extensive wetland ecosystems in the Middle East. In their lower courses, these two great rivers have created a vast network of wetlands. These wetlands comprise a complex of inter-connected shallow freshwater lakes, marshes and seasonally inundated floodplains extending from the region of Basrah in the east to within 150 km of Baghdad in the west. In their lower courses, the Tigris and Euphrates rivers create a vast complex of shallow lakes and marshes variously estimated at between 15,000 sq.km and 20,000 sq.km in extent. These wetlands comprise a complex of interconnected, shallow, freshwater lakes, marshes and seasonally inundated floodplains extending from within 150 km of Baghdad in the northwest to the region of Basrah in the southeast. The principal lakes include the Haur Sa'adiyah and Haur Sanniya complex in the north, Haur Al Hammar in the south and Haur Al Hawizeh in the east. Winter rainfall in the headwaters of the Tigris and Euphrates in southern Turkey and northern Iraq cause extensive flooding throughout Mesopotamia and, under normal conditions, fill up the lake systems in the south. After passing through the marshes, the two rivers unite at Qurna to form the Shatt Al Arab which enters the Gulf at Fao some 165 km further downstream. Until recently, the average depth of water in the main marshes during the flood season was about 1.0-1.5 m and the maximum about 2.0-3.5 m, although a depth of approximately 6 m has been recorded in Haur Al Hawizeh. Most of the lakes and marshes are freshwater, but Haur Al Hammar, the lowest in the system and closest to the sea, is slightly brackish. Numerous artificial irrigation canals, some of great antiquity, take water from both main rivers. Noteworthy among these are the Gharraf Canal at Kut, the Butaira Canal above Amara and the Chahala and Musharra Canals at Amara - all taking water from the River Tigris. In more recent times, numerous large dams and barrages have been installed on the Tigris and Euphrates, and an elaborate network of canals has been constructed to permit irrigation of the fertile alluvial plains between the two rivers. An account of the vegetation of the marshes of southern Iraq has been published in Arabic by the University of Basrah (Akbar, 1985). Throughout the wetlands, the emergent vegetation is dominated by Common Reed (Phragmites australis), Reedmace (Typha angustifolia), Papyrus (Cyperus papyrus) and occasionally Arundo donax. Phragmites dominates the more permanent areas of marsh, and Typha the more seasonal areas of marsh, while Scirpus brachyceras dominates in temporarily flooded areas (Thesiger, 1954). The deeper, permanent lakes support a rich submerged aquatic vegetation with species such as hornwort (Ceratophyllum demersum; often dominant), eel grass (Vallisneria spiralis), pondweed (Potamogeton lucens and P. pectinatus), water milfoil (Myriophyllum sp. ), stonewort (Chara sp. ), naiads (Najas marina and N. armata) and water fern (Salvinia sp.). Water-lilies (Nymphoides peltata, N. indica, Nymphaea caerulea and Nuphar sp. ), water soldier (Pistia stratiotes) and duckweed (Lemna gibba) cover the surface of the smaller lakes and quieter backwaters. The phytoplankton is dominated by diatoms, mainly of the genera Synedra, Tabellaria, Melosira, Cyclotella and Fragillaria; at least 77 diatom taxa (Hinton & Maulood, 1980) and 101 non-diatom taxa (Hinton & Maulood, 1982) are known from the brackish waters of southern Iraq. Pankow et al. (1979) found a total of 129 algae in the marshes near Qurna (72 Bacillariophyta, 28 Chlorophyta, 26 Cyanophyta, two Euglenophta and one Chrysophyta); large numbers of Desmidiaceae were also present. Al-Saboonchi et al. (1982) found a total of 63 genera of phytoplankton in five major groups (Euglenophyta, Chlorophyta, Cyanophyta, Pyrrhophyta, Chrysophyta) in the Qurna marshes. Nurul-Islam (1982) documented 59 algae from Haur Al Hammar (38 Chlorophyta, 19 Cyanophyta and two Rhodophyta). The wetlands of Lower Mesopotamia support a major fishery. Several marine fish species of great economic importance are dependent on the estuarine systems and marshes for spawning, e.g. the pomphret Pampus argenteus and the saboor Hilsa hilsa, while the penaeid shrimp Metapenaeus affinis undertakes seasonal migrations between the Gulf and nursery grounds in the marshes. This shrimp is of significant economic importance to artisanal fishermen along the coasts of the northern Gulf. The estimated annual catch of fish in the Mesopotamian marshes in the early 1960s was 30,000 tonnes, of which 70% were species of Cyprinidae. In 1990, FAO estimated that the total inland catch of fish in Iraq was 23,600 tonnes, with over 60% of this coming from the Mesopotamian marshes. The commonest fish in the catches, in order of importance, are "bunni" Barbus sharpeyi, "khatan" B. xanthopterus, "himri" B. luteus, "shaboot" B. grypus and the introduced common carp Cyprinus carpio. Commercial landings of the shrimp Metapenaeus affinis at the two main fish markets at Basrah during September-November 1985 averaged 1,000 kg/day (Salman et al., 1990). Lower Mesopotamia is the legendary site of the Garden of Eden, and possesses a number of ruined cities of great antiquity such as Ur and Babylon. Civilization was well established in this region by the 4th millennium BC, and a sophisticated irrigation system developed at that time. 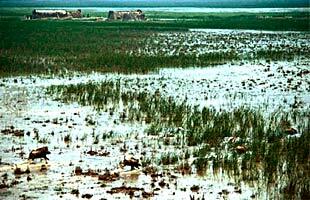 The Mesopotamian marshes have provided a home for the Ma'dan or Marsh Arabs for at least five thousand years. Their reed houses are built on artificial islands made from layers of mats, reeds and mud, and, until recently, virtually all of their needs were obtained from the surrounding lakes and marshes. The Ma'dan are primarily buffalo herders, fishermen and mat?weavers, although they cultivate a little rice. Water buffalo remain the basis of family wealth, but in recent years fishing has played an increasing role in the local economy. Traditionally spear?fishermen, catching species of barbel and carp only for their own needs, the Ma'dan have taken to using nets to catch fish for export to Basrah and Baghdad. Mat?weaving has also become an important source of income, as demand elsewhere has grown for these pliable coverings used in housing, fencing and packaging. In a region where travel is possible only by boat, the vast stretches of water and reeds have served to isolate the Ma'dan from the outside world; for this region, their culture has remained almost unchanged to the present time. The lifestyle of the Ma'dan has been described in some detail by Thesiger (1954 & 1964), Maxwell (1957), Salim (1962), Young and Wheeler (1976), Spencer (1982) and Young (1989).